More than 85,000 copies sold! Updated for current standard specifications and codes. Covering the latest design developments. 58 expert contributors. Discusses earthquake-resistant design of buildings. The classic handbook preferred by engineers around the world! The only reference to all of the important structural engineering principles and design techniques, this best-selling, world-renowned Handbook is a must for every engineer and architect who works with the design of buildings, bridges, and other structures. Practical and user friendly, it gives you concise, up-to-date information on the planning, design, and construction of a variety of engineered structures, supplemented with practical examples and detailed descriptions of design procedures. Structural engineers offer expert discussions of a broad range of topics, including: Earthquake-resistant design; Design of structural steel members; Timber structures; Arches and rigid frames; Steel and concrete bridges; Masonry construction; Tall buildings; Thin-shell concrete structures; Suspension Roofs; Soil mechanics and exploration; Fatigue and brittle fracture; Mechanically reinforced earth walls. Conforms to 1994 AASHTO specifications. Includes the latest changes in LRFD and ASD specifications of design steel members. Discusses horizontally curved steel and concrete box girder bridges. 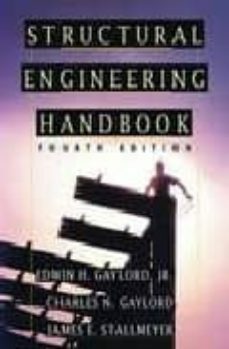 The only reference to all important structural engineering principles and design techniques, this best-selling, internationally renowned handbook is updated for current standard specifications and codes (including the 1994 AASHTO specifications) and the latest design developments. Contributions from structural engineers discuss a broad range of vital topics. Concise, practical and user-friendly, this one-of-a-kind resource gives you not only up-to-the-minute information on the planning, design, and construction of a variety of engineered structures, but also practical examples and detailed descriptions of design procedures.